I’m sure you’ve heard anti-dairy people inform you that cows’ milk is for calves, so no wonder it causes health issues in humans. Experts can debate whether or not dairy is bad for health, but the bottom line is, dairy milk is nutrient-rich and a convenient source of high quality protein, calcium, vitamin D, riboflavin, and many other nutrients. If you choose to avoid dairy milk, for whatever reason, your body still needs those nutrients. • If you are concerned that dairy is hard to digest, recognize that every person has an individual response to any food. If you personally experience bloat or a rumbly tummy after consuming milk, experiment with reducing your dairy intake to see if you feel better. If you do feel better and choose to reduce your dairy intake, learn how to get milk’s calcium, vitamin D, protein, riboflavin, etc. from other sources. 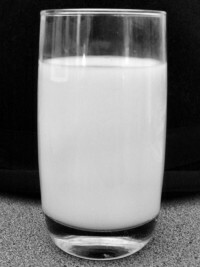 Lactose-free milk or A-2 milk are viable alternatives that can be easier to digest. • If you are concerned about saturated fat causing heart disease, choose low-fat or fat-free dairy foods. Use olive oil instead of butter. • If you are concerned about hormones in milk causing early puberty, note there are numerous hormones in both plant and animal foods. They are digested in the stomach, which kills their ability to have any biological activity. There is no science-based conclusion that hormones in dairy products cause early puberty. • If you are concerned about antibiotics in milk, rest assured, every tank of milk is tested for antibiotics and rejected if any are found. Today’s farmers use antibiotics responsibly and with sick cows. The (historic) use of antibiotics to prevent illness and/or promote growth is an added cost for farmers, and by 2020 will have been totally phased out. • If you think almond milk is an equal swap for dairy milk, think again. I refer to almond milk as “almond juice” because it is very low in protein and lacks the nutrient-dense profile of dairy milk. If you choose almond, rice, coconut or other plant milks, be sure to get your protein elsewhere in your diet. The best non-dairy alternative to cow’s milk is soy milk.